India's Sacred Sagar Island Is Shrinking Away Rising sea levels are destroying the fields and livelihoods of people on Sagar Island in the Bay of Bengal. Refugees arrived from a nearby island after it was swallowed up by waves. Scientists say climate change is a factor. Residents of the island, which is a sacred place for Hindus, say God is responsible. Our grandparents and our parents all used to stay here. We had a lot of wealth and a lot of land before this. But now we are left with very little land and very little money to survive on. More than 4 million people live on the Indian side. The delta is wrapped in the world's largest block of mangrove forest and is the habitat of the endangered royal Bengal tiger, which also is threatened by the rising waters. Standing next to Pyke is a neighbor from his village, a small, brightly clad, middle-aged woman called Durga Pal. She says the water has also swallowed up most of her family's land. Like Pyke, she is struggling to get by on a small patch of land, near the beach. "Our grandparents and our parents all used to stay here," she said. "We had a lot of wealth and a lot of land before this. But now we are left with very little land and very little money to survive on." She is surrounded by the rubble of a giant brick wall. Large broken lumps of brickwork are scattered along the beach in a straight line, as far as the eye can see. This is the remains of a barrier built by the authorities. Villagers say a cyclone ripped down the wall five years ago. Pal and Pyke believe that if the wall is not replaced, they will both soon lose all of their remaining land. Pyke does not sound optimistic. Saltwater has flooded his home several times recently. "This year, all my land will be gone because the barrier is gone," Pyke said. He will likely be forced to turn to low-paid laboring. 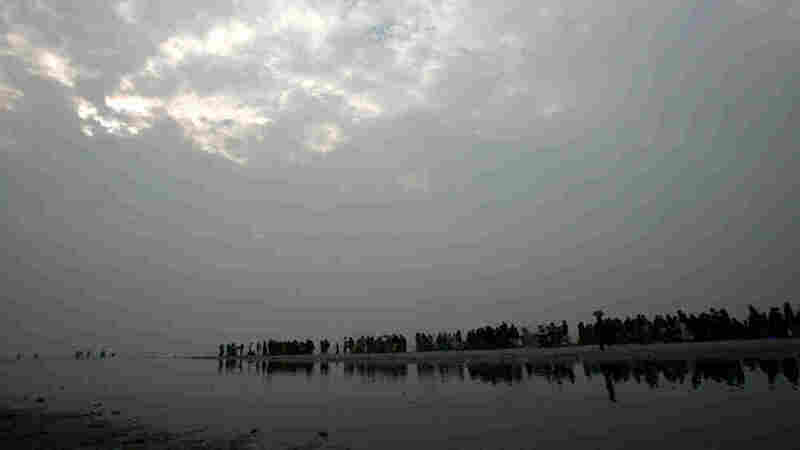 In this file photo from Jan. 14, 2008, Hindu devotees wade on Sagar Island, site of annual religious festivals that draw hundreds of thousands of visitors. The 20-mile-long island is shrinking at an accelerating pace. The perimeter of the giant scattering of islands, mudflats and swampy jungle that make up the Sunderbans have been shifting around for centuries, partly because of silt and subsidence. But scientists and locals say the rise in water levels began accelerating a few years ago. "Since 2000, the trend is actually steeper, upwards, steeper," said Pranabes Sanyal of India's Coastal Zone Management Authority. "Day by day, the deterioration is going on. Day by day, more salinization is going on." Sagar Island is less than 20 miles long. Sanyal estimates that in the past 40 years, its size has shrunk by nearly 10 square miles. Thousands of people have been displaced. Oceanography professor Sugata Hazra agrees: "For the last 20 to 30 years, we are getting more cyclones and we are losing land to the sea. This is the reality." Hazra is worried by a recent surge in skepticism about climate change, fueled by widely publicized mistakes made by the U.N.'s climate change panel, including the prediction that the Himalayan glaciers could be gone in 25 years. Hazra concedes that climate change scientists make mistakes and should correct them. But he adds: "If they lose the battle to this lobby who are trying to discredit the science of climate change, who are trying to defame the scientists, the world loses the battle." Hazra says sea levels in the Sundarbans are rising at a rate well above the global average. Several small inhabited islands have been completely submerged in the past few decades. He stresses that the causes are many and complex. But he has no doubt that human beings are playing a part. "Look, it is definitely a factor. It is not that it is just a possibility. One of the most important factors is man-made climate change." The islanders themselves are less specific. 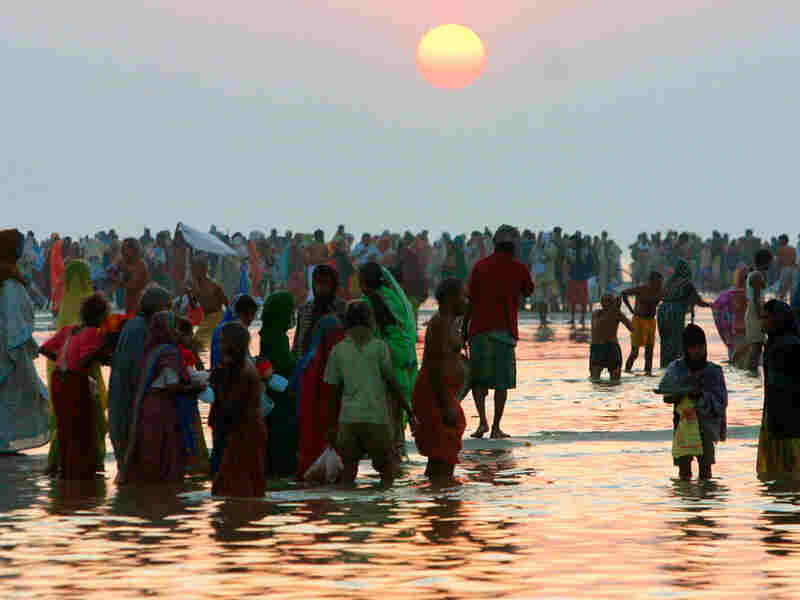 Sagar Island is a particularly sacred place for Hindus. It stands in the giant estuary where the Ganges, Hinduism's holiest river, meets the sea. Once a year, hundreds of thousands of pilgrims gather there for religious festivals. Amid the island's banana groves and palms, there are hundreds of temples and thousands of small shrines. So the world should perhaps not be surprised at the answer given by Pyke and his neighbors on the beach, when asked why they think the sea is swallowing up their land. They have not heard of man-made global warming. "God is responsible," they all agreed.